Why Are Military Dog Tags Important and How to Use Them – Militarydogtag.com, Inc.
Military dog tags play a huge role in helping soldiers identify one another in times of war when one of them has been killed or wounded. Before dog tags, soldiers used to receive plastic printed identity cards, but these were found to be too fragile and didn’t fare well in harsh weather conditions. Military dog tags are weather-proof and are specially built using a dog tags embosser. This machine was specifically created for the sole purpose of manufacturing military dog tags and it does so by using metal sheets. As the name implies, the machine “embosses” the required details of the soldier onto the inserted metal sheet based on the provided details, and out comes the dog tag. Why Soldiers Have Two Dog Tags? First of all, you must be wondering why dog tags are called ‘dog tags’ in the first place. After all, they’re not being worn by dogs, right? Military dog tags enable the military to properly identify a solider that dies while fighting in a war. That’s because in some instances, soldiers get bombed and their bodies are destroyed beyond recognition, so the only way they can be correctly identified is through their military dog tags. This way, the military can contact the family of the fallen or injured soldier swiftly, and the information provided by the tag can also be used to provide the necessary medical information that can save the life of a severely injured soldier. 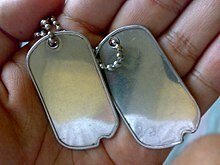 Soldiers are given two military dog tags so that the second one can be used to deliver important information during times when the soldier is unable to communicate for himself. That’s why the tags are designed so that it’s easy to break them away from each other when necessary. Generally, the dog tags that are issued out to soldiers are put around the neck on a chain. The way the second tag is used depends on the circumstances and the location of the soldier. For example, there are some circumstances where soldiers are allowed to wear their tags in their boots or to insulate the tags with rubber to prevent them from making noises in dangerous situations. Soldiers must wear their military dog tags at all times when they’re in air transit, during an operation and also whenever they’re out of the country. This is according to the regulations set out in the U.S. Army rulebook, which is a law that soldiers must live by at all costs. Dog tags are fast becoming a ubiquitous part of our modern-day society, as they’re being used for purposes other than protecting a soldier’s identity in the military. For example, the medical industry uses dog tags to record patient information such as medical history, blood type, allergies etc. Meanwhile, certain businesses in the corporate sector are using dog tags as a marketing ploy, and are encouraging customers to create a personalized dog tag with the company’s name and logo on the other side.